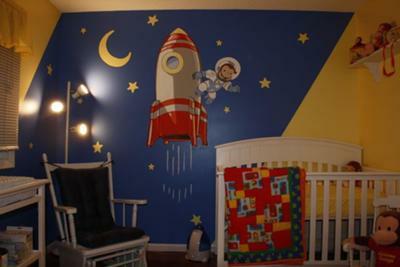 Curious George The Astronaut Nursery Wall Mural Hand Painted Art! 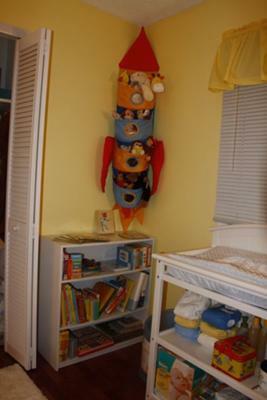 We needed to find just the right focal point for our Curious George the Astronaut nursery theme the baby's room since we knew for sure that is the one that we wanted. After looking at several of the Curious George books and studying the illustrations on their pages we found that we enjoyed the one titled "Curious George Gets a Medal" where at the end of the story he rides a rocket. We like the artwork from the original story as well as the illustrations from the updated versions. This worked in our favor as it allowed us to combine the older and newer artwork together to create our own very unique design. After we chose the picture that we wanted to feature in our wall painting, we filled in the background colors. After drawing the design on paper we projected the picture onto the wall and traced the outline. We painted with Kilz to prevent the wall paint colors from bleeding through the graphics and then we drew in the remaining details. After that step was completed, we painted in the mural and then traced the design with a black outline for emphasis. We matched the colors used for the decorations in the room to the bright yellow, blue and red we used in the mural making it both the inspiration piece and the room's focal point. We painted all of the nursery furniture and the shelves on the wall (that my husband made shelves to display the various decorations) a neutral white to offset the bright blue and yellow wall paint colors. My husband sanded and re-painted my rocking chair that I had when I was a toddler and a used glider we got from my parents as a gift that had been stained a wood color. We found a Curious George doll in the perfect size and placed him in my old rocking chair. We shopped online as well as in speciality stores for tins, dolls and Curious George toys that we could use to decorate the room. 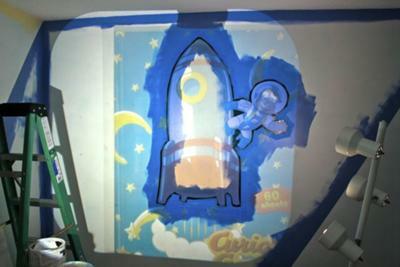 Our efforts paid off and we found a rocket lamp and several tins that reflected the Curious George Outer Space Nursery Theme. This is so different from any nursery pictures that we have ever received. The Curious George baby bedding and the mural work perfectly together! I love rocket ships and astronauts AND that silly monkey, Curious George and this room has all of the above so yeah..I love it! 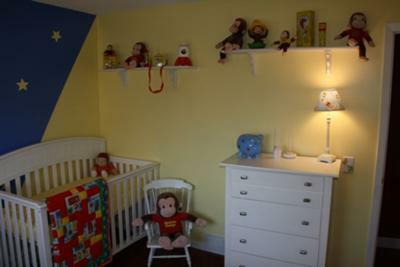 The Curious George wall mural is great and you are sure to get lots of favorable comments from visitors that stop by Unique Baby Gear Ideas and see pictures of your DIY nursery project! I am proud of curious you! My 2 year old adores Curious George. We read several books a day and he loves the cartoon. Very cute! Super ideas! Saw it on Flickr and had to come over and give it an A+! What a unique idea and wonderful job on the artwork and pulling it all together! This room is amazing! Great job!! Join in and write your own page! It's easy to do. How? 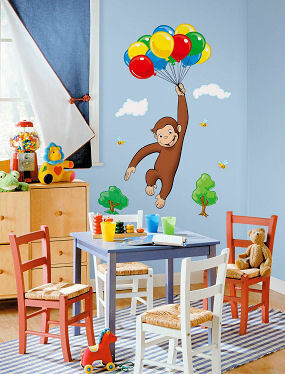 Simply click here to return to CURIOUS GEORGE THEME NURSERY PICTURES and DECORATING IDEAS.